American actor, Will Smith will star as Genie in "Aladdin," which hits theaters on May 24, 2019. Will Smith just made some faithful Disney fans’ dream come true! On Wednesday, the "Suicide Squad" star posted the first poster for the remake of the musical "Aladdin," in which he’ll be playing the wise-cracking genie! The post features smoke trailing out of a thin, ornately decorated lamp set upon a rock from behind which light exudes. “Choose wisely,” the tagline reads, along with the month of the film’s 2019 release — May. Smith also hinted that his character is going to share some physical similarities with Robin Williams’ take on the wish-granting character in the 1992 film. “LEMME OUT!! Can’t wait for y’all to see Me BLUE!” he captioned the fun image. This teasing post from the 50-year-old actor isn’t the first regarding the forthcoming Disney project. Back in Sept. of 2017, he shared a photo on Facebook featuring some of his castmates on the production including Mena Massoud (playing Aladdin), Naomi Scott (playing Jasmine) and Marwan Kenzari (playing Jafar). Aladdin is just one of several live-action adaptations in the works from the House of Mouse, they are also hard at work on "Mulan" and "The Lion King." 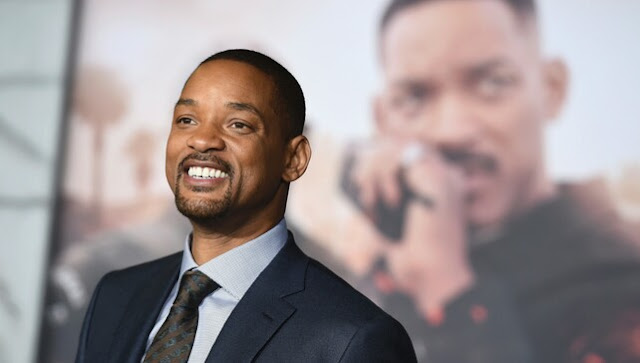 This exciting post comes just weeks after Smith posted a clip of himself bungee jumping out of a helicopter into the Grand Canyon to mark his 50th birthday, which his wife, Jada Pinkett Smith, later admitted to ET that the stunt definitely tested her faith. “It was a really great moment for me, because it's one of those moments where your faith is truly tested,” she said at a Careers in Entertainment event, co-sponsored by the Will and Jada Smith Family Foundation. “When I saw him fly outside the helicopter, that's when I got a little nervous because I didn't know that was happening, it wasn't actually the jump".